– “You will cut the damn tree down”, one neighbour said. – “Not a chance!” answered the other. Having said that, both parties crossed their arms, backed in their chairs and stared at each other. Fortunately enough for them, they were not alone in the room. The mediator helped them to put the conversation back on tracks. They were lucky. Not even knowing that similar story happened many miles away many years ago. At that time, the outcome was, however, not so fortunate. As I am writing this post, the 2018 Winter Olympics is currently taking place in Pyeongchang, South Korea. By far, this is not the first time when Olympics are hosted in the territory that raises some controversies. Though it should be regarded as a celebration of peace and peoples’ unity, the Olympics was misused by different nondemocratic regimes in the past. This time, there have been numerous talks about the security of the participants due to the state of relations between North and South Korea and recent nuclear weapon test organised by the former. Although for many unconcerned readers, this might sound like a surprise, there have been tough negotiations hold by representatives of both sides about something as simple as North Korean athletes’ participation in the Games, the unified women’s ice-hockey team and about the flag both parties would march under during the opening ceremony. For the stakeholders, this is, however, a huge achievement though not accepted unilaterally. For the outsiders, the situation might look surreal. So for instance, the sixty-five years old Korean War, which raged from 1950 to 1953 never came to a formal end. Technically, it is still lasting since the peace treaty was never signed. The conflict was merely suspended with a cease-fire agreement. By far, this is not the only peculiar example of present dispute’s complexity. There are two cases that perfectly illustrates a weird nature of peace talks in the region. On the other side of the table, Maj. Gen. Ri Choonsun sat. He considered the last statement as offensive and decided to rather a rather uncommon reply. He sat silent, glared at the American, hands crossed. According to the then rules, the party that had called for a meeting also proposed a recess. This was obviously something general Ri did not have a slightest intention to do. In the war of nerves, the two soldiers sat there, arms-folded, for four and half hours without saying a word. Finally, it was the Korean negotiator who gave up and walked out of the table. Anyway, this was a superhuman achievement by both the men – the session lasted 11 hours and 35 minutes. During that time, none of the personnel was allowed to eat, not even to go to the toilet. Much sadder though not a bit less kafkaesque accident happened seven years later at the same place. 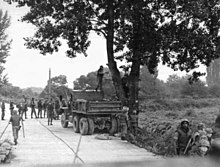 On the morning of August 18, 1976, a group of American and Korean soldiers set off to trim a poplar tree that blocked the line of sight in the Korean demilitarised zone. The workers refused and continued with their task. After another twenty minutes, a North Korean guard truck crossed the borders carrying some guards with crowbars and clubs and attacked the other side. As a result, Captain Arthur Bonifas and First Lieutenant Mark Barrett were hacked to death with their own axes, many other persons were injured. The United Nations Command decided that the tree will be cut down with the aid of overwhelming force as a demonstration of its power, but without causing further escalation of the conflict.The operation Paul Bunyan was scheduled for August 21, 1976. And so the most bizarre logging in history took place. According to the record, the following equipment was used by countless troops: Axes, chainsaws, clubs, combat engineer vehicles, rafts, 20 utility helicopters and 7 Cobra attack helicopters, B-52 strategic bombers, F-4 Phantom fighter-bombers, South Korean F-5 and F-86 fighters, F-111 bombers and the aircraft carrier USS Midway. The actual cutting lasted for 42 minutes and was carefully watched by North Korean soldiers. The tree stump, around 6 m tall, was deliberately left standing as a memorial to the unfortunate accident. It stands there even today in order to commemorate a tree that almost became a trigger to the Third World War. Quite paradoxically, even one of the 2018 Olympics issues relates to trees. Some of the environmental groups have raised concerns related to the deforestation of in the neighbourhood of the Jeongseon Alpine Centre. According to the organisers, the forest will be restored after the games are concluded. Notwithstanding this and some other controversies, we can say that, once again, the ancient spirit of Olympics – the Olympic Truce or “Ekecheiria” prevailed: Even during the ancient Games, the athletes, artists and their families, as well as ordinary pilgrims, could travel in total safety to participate in or attend During the Truce period. Believe it or not, we discussed the Olympics with the neighbours mentioned at the beginning of this post as soon as they signed the settlement. This time, no tree was harmed.